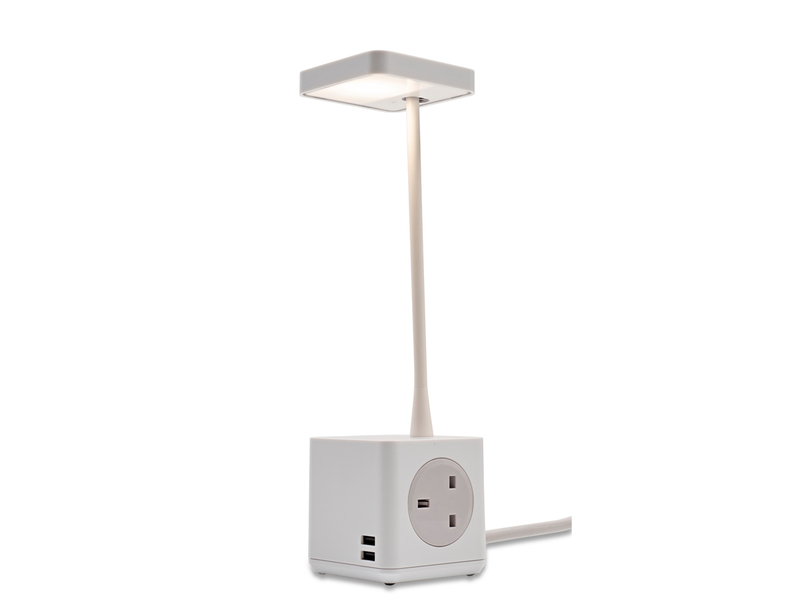 Cubert provides power for personal devices in an integrated form – factoring the arrangement of light, USB and mains that is more compact than ever achieved before, so it’s easier to use and takes up less space..
Cubert has the ability to power and charge via two mains sockets and also includes two high-speed, smart-charging USB ports. Cubert also comprises an intricate, high-quality LED light with a touch-sensitive dimmer. Cubert’s unobtrusive design makes it versatile and adaptable in a variety of environments, from desks to breakout areas, from meeting rooms and receptions and even bedside tables. Due to its ultra-compact footprint, Cubert has a minimal impact on surface space and allows easy positioning of lighting and power sources without having to rely on fixed furniture or ambient lighting. Wash surfaces with a Damp cloth and dry with a soft cloth. Do not drop or expose to moisture. Always disconnect from power source when cleaning.